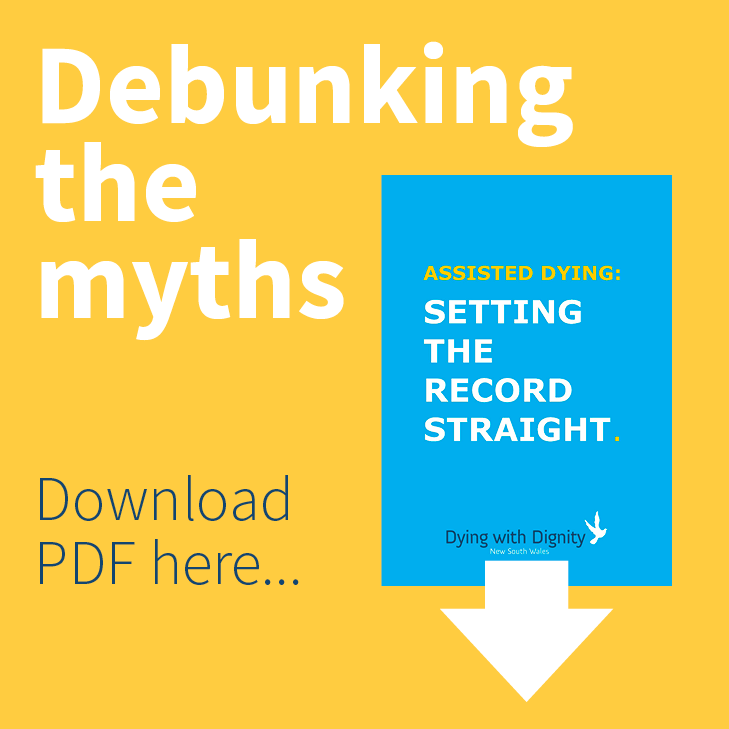 Dying with Dignity | Where do the candidates stand on assisted dying laws? Question 1: Do you, in principle, support the concept of voluntary assisted dying laws? That is, laws that would permit terminally ill people to ask for assistance to die, provided that they have decision-making capacity and are not subject to any coercion? Question 2: Would you have supported the recent Federal Bill on restoring the rights of the Territories to legislate to allow voluntary assisted dying? 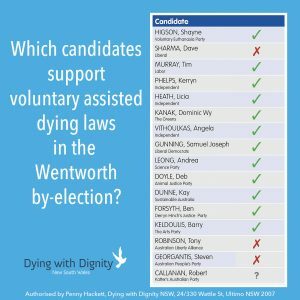 Based on their responses we created this scorecard to give voters in Wentworth an idea of which candidates support assisted dying and those who don’t. Authorised by Penny Hackett, Dying with Dignity NSW, 24/330 Wattle St, Ultimo, 2007. 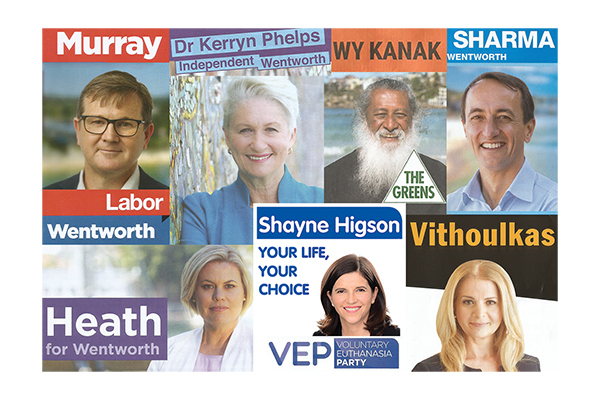 Dying with Dignity NSW were pleased that twelve of the sixteen candidates in the by-election provided a positive response to our two questions and in particular, we are very happy that the new member for Wentworth, Dr Kerryn Phelps, is now a supporter of voluntary assisted dying. Dr Phelps, a former head of the AMA, has indicated that she will be willing to support our 2019 campaign when the next NSW VAD Bill is debated. Here are the responses from the two top candidates. As a doctor, I believe that no person should be forced to suffer when all reasonable palliative care measures have failed to relieve that suffering. I have discussed this with my colleague Dr Brian Owler, who was the Chair of the Victorian Ministerial Taskforce and a fellow former AMA President. He assured me that the Victorian Assisted Dying Legislation was evidence-based, and included 68 safeguards to protect against the laws being abused. Following wide consultation, the Victorian Voluntary Assisted Dying Bill 2017 contains strict eligibility criteria with a rigorous assessment process including decision-making capacity of the affected person. Ultimately, this is about respect for the dying person’s choice about the timing and manner of their death. The Victorian law with its safeguards may act as a blueprint for other States and territories to consider their own legislation. It is time that the rights of Australian territories were restored to allow them to debate and potentially set their own assisted dying laws. “I recognise that under Australia’s constitutional arrangements, this is an issue primarily for states. I respect the views of others on this important subject, however, in principle I am uncomfortable with the taking of human life. It is one of the reasons I am opposed to the death penalty, under any circumstances. My position on voluntary assisted dying legislation would depend very much on the specific legislation proposed, the safeguards included, and the opinions of medical and ethical professionals.